Messy, slimy, oozy, electrifying, glowing fun! 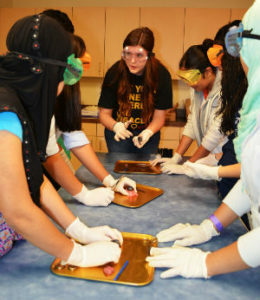 DHDC Science Labs feature hands-on, engaging activities for students in grades PK through 12 addressing a variety of science, math and engineering concepts. 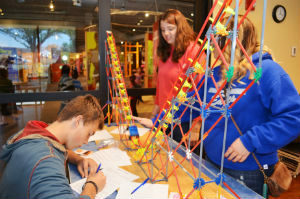 This section details Science Labs available at the Discovery Center. For information on our on-campus Mobile Labs, please visit the mobile labs page. Each lab is approximately 45 minutes long. Maximum of 30 students in a lab at one time. Multiple lab rotations available to accommodate larger groups. 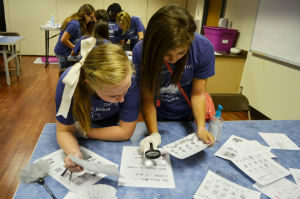 Lab activities and concepts addressed vary by grade level. Modifications available for GT and AP students, ESL students and students with special needs. 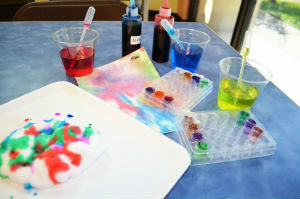 One of our most popular labs with both students and teachers, Color-rific explores concepts of mixtures, physical changes and chromatography in a uniquely colorful way! 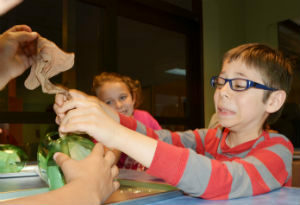 Students will love this creative approach to science and enjoy creating their own artistic science project to take home. 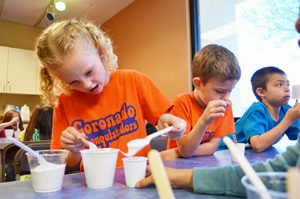 Grades PK-2 explore physical changes in matter and are introduced to mixtures as they create their own colorful concoctions! Grades 3-5 delve deeper into physical changes and mixtures as they explore the process of chromatography and discover the real-world applications for this scientific process. Magnetic forces are at work all around us. 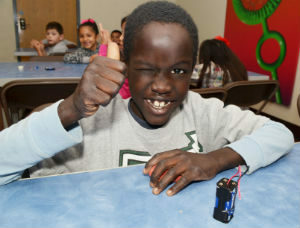 Magnet Mayhem investigates properties of magnetism and the relationship between magnetism and electricity. Grades PK-2 investigate properties of magnetism including polarity, magnetic vs. non-magnetic items and explore where magnets are used in our daily lives. Grades 3-5 explore the relationship between magnetism and electricity and discover how properties of magnetism are at work in modern technology. 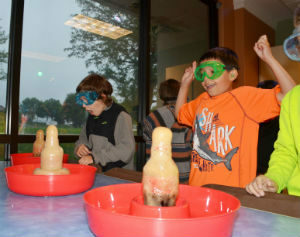 From basic properties of matter to a study of polymers and non-Newtonian fluids, The Mysteries of Matter examines solids, liquids and gases DHDC style – entertaining, slightly messy and oh so fun! 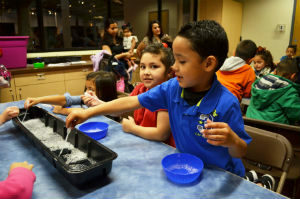 Grades K-2 examine properties of solids, liquids and gases and experiment with physical changes to matter. Grades 3-5 assess physical and chemical changes to matter and explore special classes of matter such as polymers and non-Newtonian fluids. What is light? How does it travel? Does light have color? 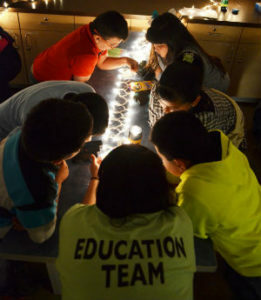 Using prisms, mirrors and spectroscopes, students will analyze the amazing properties of light. Grades 3-4 explore properties of light including white light, the light spectrum and how light affects vision and perception of color. Grades 5-8 analyze properties of light, compare refraction and reflection and investigate the relationship between light and color. In this inquiry-based introduction to machines and engineering, students build their own models using K’NEX® sets and discover how simple machines are combined to create the mechanical items we use in everyday life. 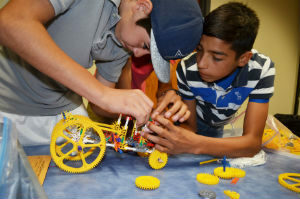 Grades 6-8 will create small-scale models of common machines such as tow trucks, lawnmowers and elevators, but beware – as in life, there may be challenges which require fast-thinking to achieve their goal! Grades 9-12 teams’ ingenuity and analytical skills are put to the test as they navigate a series of cutthroat design challenges to create their working mechanical models! Isolate, extract and compare DNA samples in this highly engaging lab which introduces students to the basics of DNA analysis. Grades 4-8 extract and compare two plant-based DNA samples and discover their similarities and differences. Grades 9-12 extract and compare a plant-based DNA sample with students’ own DNA samples and identify the similarities between them. HELP! Donnie, the DHDC Mascot, has been kidnapped! Students become crime fighters in this immersive lab experience. Once inside the DHDC Crime Lab, students must use forensic tools to identify the kidnapper and rescue Donnie – before it’s too late! Grades 5-8 conduct their investigation using fingerprint analysis to identify the dastardly kidnapper while learning how to lift and analyze fingerprints using the same tools are forensic detectives. Grades 9-12 will conduct presumptive blood tests on a series of unidentified substances and analyze simulated blood samples to catch the culprit and save the day!